I am about to start a new habit. I’ve starting writing more and more formal essays, and I want to get back into the habit of brain dumps. Half-baked ideas people can comment on, complain about, or help bake. This morning, I was listening to a podcast about writing, and they were discussing writing every day versus binge writing (i.e. a writing retreat, the upcoming NaNoWriMo, etc.) Daily writing habits scored better in every way except in depression. I do think it’s really painful for a writer to finally get started on a piece of work, find a rhythm and then have to stop because life. I have historically done 500 words of September, but I had a rough September this month and it slipped my mind. 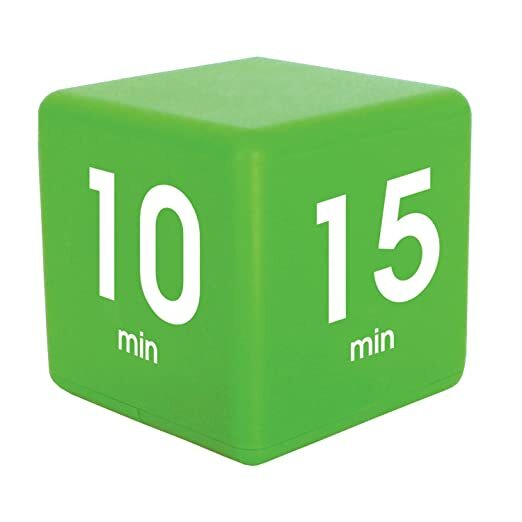 But I have this cube timer on my desk, and let’s see what happens. What’s interesting (to me) about this experiment is that I almost didn’t start it because it’s Wednesday. Who starts a new effort on a Wednesday? In Dan Pink’s book, When, he discusses the concept of Temporal Landmarks. New Years is a famous one, of course. It’s where we swear this year we really will look 20 pounds, run 10 miles and meet the human of our dreams. Temporal landmarks are the underpinnings of a lot of my work helping teams be more effective. OKRs have their rituals. The quarterly review and set, the annual planning, Monday commitments and Friday celebrations. I’m 99% sure that’s why OKRs are different and more effective than SMART or KPIs. They are goals with an execution schedule. “Set and forget” is the enemy of goals. But through the magic of a calendar, we can make our goals part of our daily life. The ticking clock of the calendar works a lot like the ticking clock in a thriller as well! You can’t help but be aware that the months pass: 1,2,3. I’ve been studying team performance for the last several years, and my big breakthrough was some teams have temporal landmarks and some do not. Many teams didn’t have any rhythm. They were created suddenly or evolved, they ended suddenly or dissolved. Most teams are like the Ulysses’s Ship: if every piece was replaced during the journey, was it the same ship that arrived at port? Creating temporal landmarks for teams, where they could revisit their goals, roles and norms, help them to avoid drifting into mediocrity. When I add in the OKR rituals (to steal an agile term and technique) such as weekly retrospectives and formal postmortems quarterly, teams can buy the time they need to reflect on who they are and who they want to be. It’s even relevant to me personally. I don’t want to drift through life, waking up with a bucket list of regret. My weekly and quarterly goal setting keeps me true to my goals. A good goal should have a goal post after all. p.s. Plus 5 minutes of editing ONLY. Separator image Posted in Half-baked, High Performing Teams.